Enjoyable financial thriller, anchored by a top class performance from Richard Gere, though it doesn't grip quite as hard as it should, since it's so difficult to sympathise with the lead character. 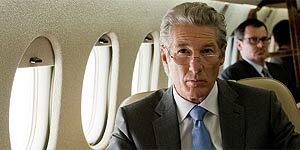 Directed by Nicholas Jarecki, Arbitrage stars Richard Gere as wealthy New York hedge fund manager Robert Miller, who lives the high life through a practice of arbitrage, a term meaning simultaneous buying and selling in order to make a profit by exploiting the difference between market prices. When he decides to sell his company, his wife Ellen (Susan Sarandon) is thrilled and his high-flying daughter Brooke (Brit Marling) is poised to profit from the situation. However, when Robert gets into a disastrous car crash with his French art-dealer mistress (Laetitia Casta), he makes the snap decision to flee the scene of the crime and calls his friend Jimmy (Nate Parker) to help out instead. This puts tenacious cop Bryer (Tim Roth) on his trail and Robert soon finds his privileged life crumbling around him, so he takes increasingly desperate measures to ensure that the crucial deal goes through before his misdeeds catch up with him. Richard Gere is on top form here, charming his way through a variety of sticky situations without even ruffling his perfect hair-do. Roth is equally good as the sweaty detective determined to bring down his high-flying target and there's strong support from Susan Sarandon and Brit Marling, both of whom get emotionally meaty scenes of their own. Jarecki wisely decides to keep the financial mumbo-jumbo to a minimum (it never explains the title, for example), but the metaphor is clear enough, namely that shady business practices-slash-morals will eventually lead to both financial and personal downfall. In addition, the film is crisply shot, courtesy of Yorick Le Saux's cinematography and Jarecki keeps things moving at a decent pace throughout. It's a testament to Gere's sheer star power that we root for Robert as much as we do, despite the fact that he's eminently unworthy of our sympathy. Ultimately, that's the main problem with the film, since you care less and less about his predicament as the film goes on; as a result, the ending of the film lacks emotional impact and feels rather empty. Maybe that's the point. Arbitrage is an engaging and watchable thriller with a terrific central performance from Richard Gere. It would also make an interesting double bill with American Gigolo. Worth seeing.